In less than two hours you will have long-lasting, full, lush lashes without the messy clumps from mascara. Your new look will last for up to eight weeks – longer with regular maintenance. Semi-permanent lash extensions are a process where synthetic lashes are bonded to your own using a medical grade adhesive. The process is painless, relaxing, and produces instant results. Best of all, your lash extensions will become a part of you! After 24 hours you can expose your lashes to water, steam, and intense physical activity. With Classic Lash Extensions each viable lash is extended up to double its natural length; for each natural lash you have, one extension can be applied to extend its length. The length and the thickness you can achieve is determined by the health and texture of your lashes as well as the number of lashes you have. 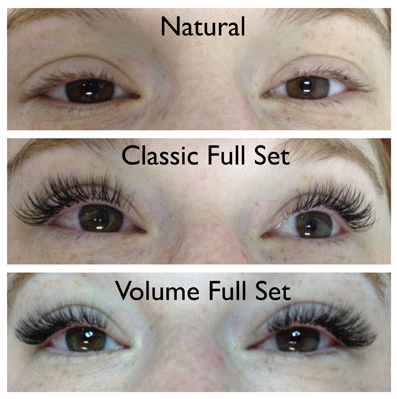 Strong, healthy lashes can support more length and thicker extensions. The more lashes you have the more extensions can be applied for a fuller look. If your lashes are weak, frail, extremely fine or sparse then you are not a candidate for a full, thick, dense look. The lashes you wear must fine - wearing heavier lash extensions can harm your lashes causing breakage and limited growth. In either case you will immediately notice a dramatic enhancement to your eyelashes. The effect is very natural and flattering to any eye shape or color. Russian Volume or 3D Lash Extensions are the next generation of lash extensions. Unlike Classic Lash Extensions, these lash extensions are feather light allowing between 2 and 7 exensions to be safely applied to each of your natural lashes. The result is a more pronounced look. 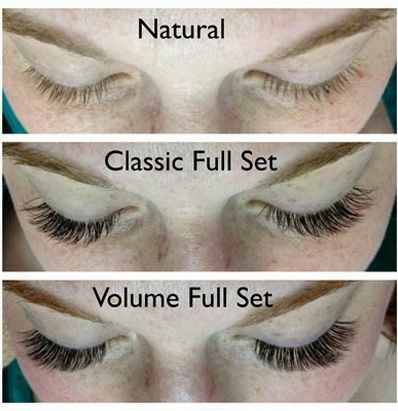 While the intensity is far greater than Classic Lash Extensions, 3D Lashes still look incredibly natural. 3D Lashes are more resiliant that Classic Lash Extensions. More lashes means that it takes more time for the lashes to shed. Another benefit to 3D Lash Extensions is that because they are light weight they cause even less stress on your natural lashes. This option is a great solution for those than have thin, fine, or sparse lashes as well as those that want a more dramatic look.